The Lemon Beagle is nothing short of beautiful. They’re stunning creatures. If you have experience in dog handling and want a pup that’s amazing with kids and strangers, they’ll make a fabulous addition to your household. Continue reading this blog post to find out more about these amazing dogs! Please note that Lemon Beagles, like Pocket Beagles, aren’t a separate breed. Lemon Beagles are just a specific color of Beagle; so don’t let that confuse you. With that being said, let’s dive on in! What Does a Lemon Beagle Look Like? Where Do Lemon Beagles Originate From? What Are Lemon Beagles Used For? How Clean Are Lemon Beagles? 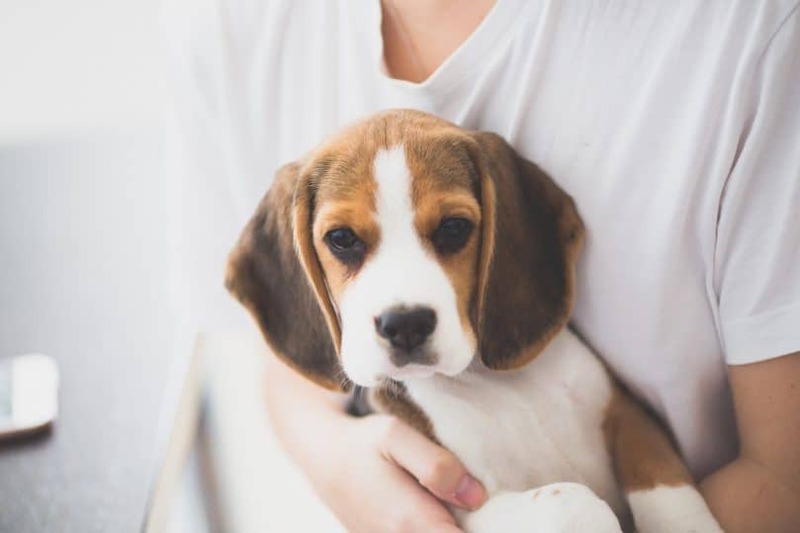 Are Lemon Beagles Healthy Dogs? How Much Are Lemon Beagle Puppies? Lemon Beagles have a stereotypical hound-look. They sport a beautiful combination of lemon and white colored fur and gorgeous hazel eyes. They’re incredibly rare due to the lack of pigmentation on their bodies. However, they’re not albino. This is a common misconception. It’s an easy mistake to make because of their appearance; the pink rims around their eyes, nose, and lips, etc. As you might have already guessed, ‘Lemon’ is just a phrase to describe coloring. Therefore, Lemon Beagles have loads in common with other kinds of Beagles including their sizing. It’s common for newborn Lemon Beagle puppies to be almost entirely white. However, as the pup grows, their coat gradually changes; puppy fur tends shed after a year, that’s when their adult coat comes through. When this occurs, your dog will look entirely different, but in a good way. Their gorgeous tan coloring eventually comes through, giving them a distinctive two-toned appearance. Fun Fact: pure Beagles can’t be one block color, as they don’t possess genes that allow that. 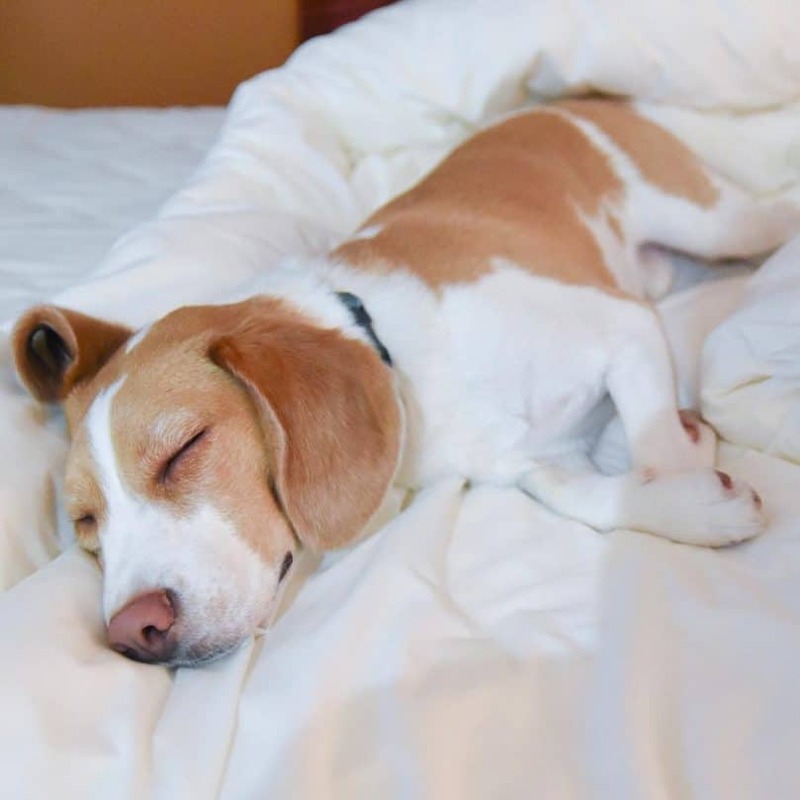 Interestingly, Beagles sport distinctive markings known as “ticking.” These are tiny spots on their legs and undersides, and on a Lemon Beagle, this sometimes makes them look dirty! Fun Fact #2: The lemon coloring is the lightest of all the Beagle furs (including tri-colored). Yet, they boast the darkest noses- go figure! Unfortunately, the origin of Beagles isn’t clear-cut, especially the lemon-colored ones. They were bred so long ago that it’s hard to pinpoint when they became a distinct breed. Beagles were apparently used in England as hunting dogs by the Romans, which makes their lineage literally ancient. It also explains why they love digging so much! Lemon Beagles were bred to find rodents that would burrow underground to hide, so they had to dig to get them. Therefore, digging is a second nature to them. 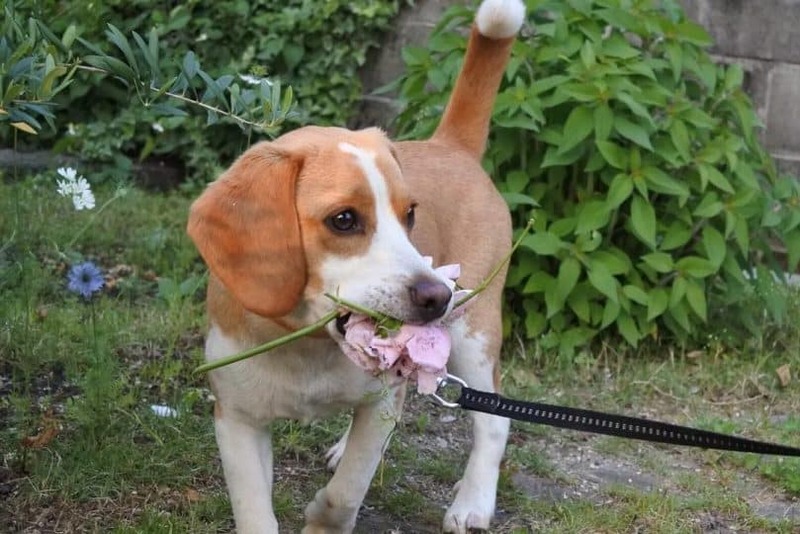 If your garden is your pride and joy, then a Lemon Beagle might not be a great choice for you- unless you’re cool with your prized flowerbeds being dug up! Although Beagles (including Lemon Beagles) are active animals, they’re famous for their friendly nature and calm disposition. In the wild they’re pack dogs, so they generally socialize well with other pets and humans. Their adorable temperament is charming; they just want to be everyone’s best friend! Naturally, this makes them excellent therapy dogs for both children and adults. 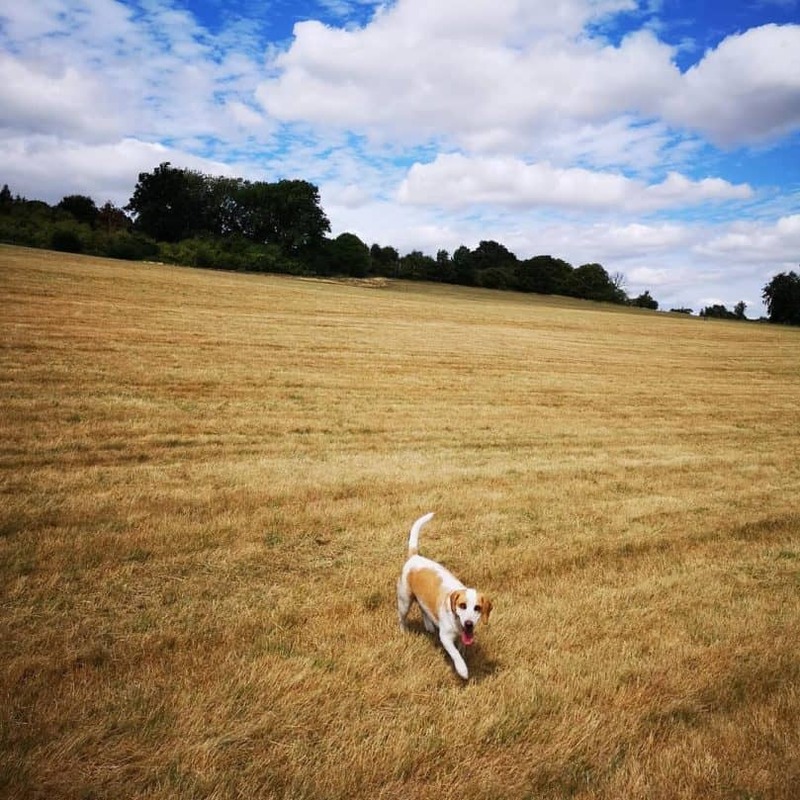 So, if you’re after a dog that’s great with kids, and other animals, then the Lemon Beagle will make the perfect addition to your family home! On the downside, Beagles are very independent, which makes them difficult to train. Like other dogs, they’re extremely motivated by food, so try and use healthy treats as part of your training methods. This will undoubtedly help in speeding up the process! As we’ve already said, Beagles were initially hunting dogs. They would sniff out rabbits and hares, and some are still used for this today. This is more common in the southern states of America. 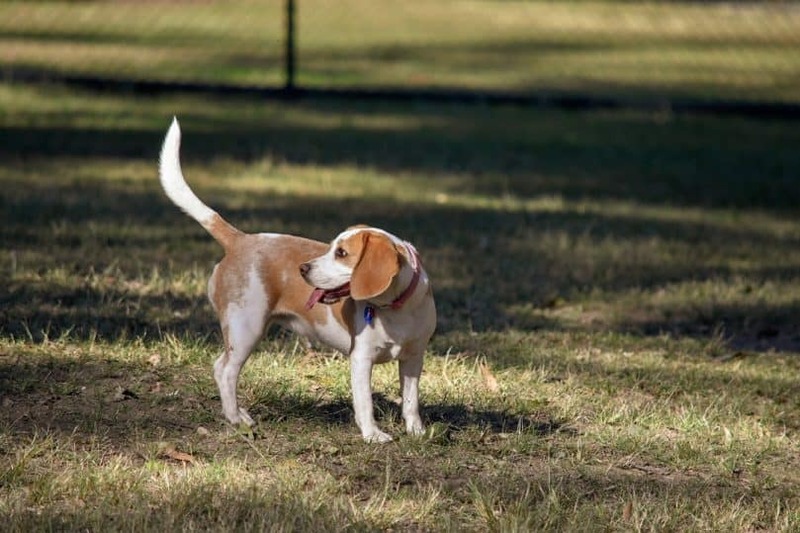 Nowadays, Beagles (of all types) are more likely to participate in tracking competitions also known as “field trials.” This where they’re placed in a meadow and instructed to track rabbits. Judges follow on horses and assess how well they’re able to trail. Top Tip: because of their high prey drive Beagles are known for running away during walks. That’s why it’s imperative to keep them on a long leash when walking in public (or at least until you’re confident they’ll come back when you call). Besides hunting, they’re also used by the U.S. Customs and Border Protection Agency as detector dogs. They play a vital role in screening passengers. Despite their hound-like faces, you’ll be pleased to hear that Beagles don’t drool. On the contrary, they’re incredibly clean animals, and their fur is very easy to maintain. Although Beagles barely shed, however when they do, it’s more likely to be the Spring and the Fall. During these seasons you’ll have to brush them more regularly because shedding is way more likely. Gum Problems: It’s likely your Lemon Beagle will have issues with their mouths and teeth, so it’s essential to put time and effort into ensuring good oral hygiene by brushing their teeth. Obesity: this is a severe problem in Lemon Beagles. In light of this, you need to control their diets and encourage them to exercise regularly. Cherry Eye: This is a layman’s term to describe a prolapse in the third eyelid. Yes, you heard right- dogs have three eyelids on each of their eyes! Glaucoma: This illness refers to undue pressure placed on your dog’s eye. This triggers insufficient fluid drainage, and if Glaucoma continues, it’ll eventually create long-lasting damage to the optic nerve. This could result in complete and permanent blindness. Despite all these diseases, a Lemon Beagle lifespan is usually estimated at 13 and a half years, which is pretty good! Lemon Beagles are incredibly rare, so they’re more expensive than other colored beagles. You should expect to part with anything between $500 to $1,300 (£380 to £1000) for a new pup. The quality of each of the parents. Whether the puppy is show-quality. The degree of training the pup’s already received. Our best advice is to find a reputable and reliable breeder. Start by inquiring after family health problems that might affect your puppy. Fun Fact: If the ‘Lemon’ gene is dominant in both parents, you might get a beautiful litter of Lemon Beagle puppies. However, as Beagles come in a variety of colors, there’s no guarantee you’ll produce lemon colored pups. Or, if you’re interested in lemon beagle rescue, take a look at the following sites: Basset and Beagle or Nittany Beagle Rescue. If you want a beautiful, family-friendly dog, then the Lemon Beagle is the perfect pet for you. However, be sure you have ample time to train these pups before you commit to buying one. Like we’ve already said, they can take a while to teach, but they’re certainly worth the wait! Thanks for sticking with us. Let us know in the comments if you’re thinking about getting a Lemon Beagle, or prefer more common colors; we’d love to hear from you!